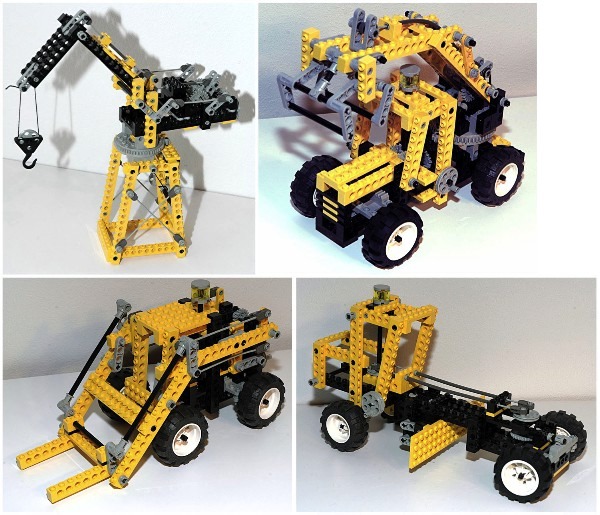 Six new models were released in 1991, many of which incorporated fairly complex new systems of parts. There were two motorcycles, both of which used the new head tube to achieve a realistic rake on the fork. The larger motorcycle also had a chain driven V-2 engine and both front and rear suspension using the new shock absorbers. 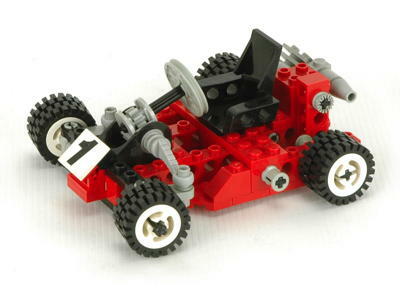 A small go-cart featured a one cylinder engine and rack and pinion steering. A small Jeep-like truck had rear suspension and steering. A large universal set showcased the new flex system with 4 complex models. Finally, a large helicopter, the largest to date, was packed with features including the flex system and a new cyclic system for the main rotor. As if this wasn't good enough, the helicopter also had a deployable winch and retractable tricycle landing gear. Chief among the new features was the flex system. It included flexible cables of various lengths along with ends which could be snapped on and would attach to either an axle or a ball joint. Additionally, there were sleeves for the cables which allowed them to be routed through structure and used as a push-pull cable (Bowden cable). When combined with a new ball gear similar to a Constant Velocity Joint, this system made for a fairly realistic cyclic motion on the large helicopter. The flex system is a fascinating concept which was rarely really used to its fullest potential. It was only ever included in 15 sets, many of which used it for the same type of rotor motion as the 8856. One reason for the lack of use might be the fragility of the cables. The cables are made of a different type of plastic which, while flexible up to a point, can easily end up with brittle fracture if bent too far. This is especially a problem when removing the ends. Tugging too hard can easily shatter the cable and repairing them is not easy (but possible; I broke and repaired one while writing this year's section). Later, different ends were introduced which made it easier to attach and remove them. Also new this year were several motorcycle components including a wheel and tire, a head tube, and a larger set of shock absorbers. 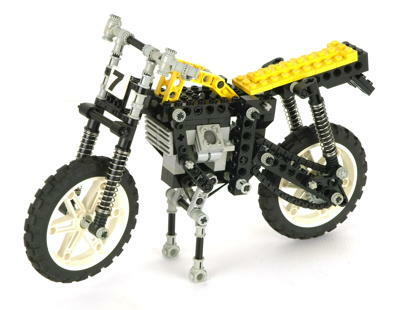 Combined with the reciprocating engine and a drive chain, this made for a motorcycle which was quite functionally realistic. 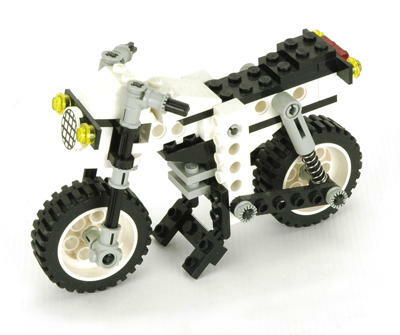 The wheel was only ever used on motorcycles, and only came with 4 sets as of 2008. A new flexible push-pull cable system (Bowden cable) was introduced. It could be used as a standard link, for transmitting force around corners, or simply as a diagonal brace in a truss. The central item is a flexible plastic cable with a small neck on either end used for clamping. The cable has been available in a variety of lengths over the years from 3 studs long all the wy to 33. They are fragile and easily broken, so finding a replacement can be pretty difficult. Be careful with them. They were almost always light gray. The other item is a hollow cylindrical tube which is also flexible but not brittle like the cable. This served as a sheath for the cable, guiding it through the structure and preventing buckling under compression loading. This tube was later also used as an extension and connector for pneumatic tubing. They were almost always dark gray. The end connector has an axle hole and a slot for the cable. The slot has a tab which grabs the necked portion of the cable. The cable snaps into place when inserted from the side if done with care. There is a second end connector which has a slightly different hole to snap onto ball joints. The regular end is dark gray and the ball end is black. Both were later replaced with different versions which were easier to install. The new shock absorber has a much longer stroke than the old one (which remained in production). Over the years, it was mainly used on motorcycles, but also found its way onto a couple of the very large vehicles as well. The motorcycle head tube has a 2x2 brick on one end and a yoke on the other end which allows for a fork rake of approximately 25 degrees. This part was only ever used once in a set for a purpose other than as a motorcycle head tube. The somewhat misleadingly named triangle is a 1/2 thickness link which is 5 studs wide at the bottom, 1 stud wide at the top, and 3 studs high. 5 of the holes are round while the two lower corners are slotted to lock axles. This part has become pretty standard in most Technic sets from this point forward. A new large motorcycle wheel and tire were introduced. The wheel has 6 spokes and a cruciform hub. 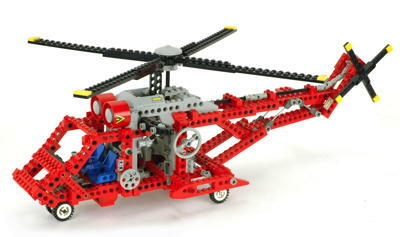 It only ever came in white in 4 Technic sets. A brand new rotor system was introduced which allowed the rotor to mimic the motion of a cyclic. The heart of the system is a spherical ball gear with 8 teeth and an axle slot running along the central axis. The part was rarely used except in a couple of helicopters and once as a CV joint. The 4 blade rotor has a central recess to allow insertion of the ball gear. There are 4 small pins evenly spaced around the inside of the recess which lock onto the gear, forcing the rotor to rotate with the gear, and therefore with the driving axle. Since the gear is spherical, the rotor can pivot freely on the other two axes (torsional constraint only). The final part of the rotor system is what I will call the swashplate. 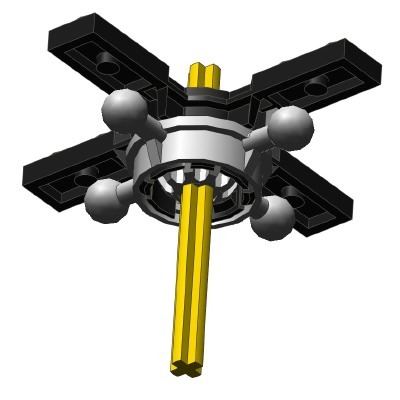 It has 4 equally spaced ball joints and a hollow center which snaps around the rotor sleeve. The idea is for the rotor to spin within this, but for the swashplate to remain stationary. 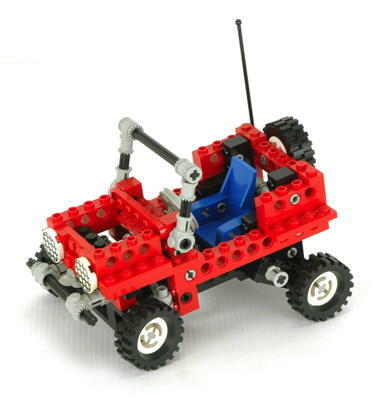 It accomplishes this by grounding itself to the structure using one or more of the ball joints. One or more of the remaining ball joints can be coupled to a cyclic control to allow the rotor to tip both side-to-side and forward-back. This isn't quite how a real helicopter cyclic works with each blade changing pitch as it rotates, but it certainly gives the Technic helicopters a realistic feel. It was only included in 2 sets, both of them sweet.